Overnight Summer Camps in Pennsylvania - SMA Sports! 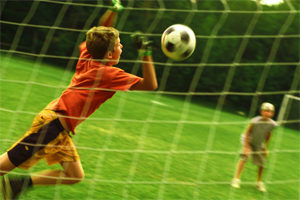 Although SMA isn’t a “sports camp,” we do offer team and individual sports activities every day. We focus on participation and fun, and many sports activities are followed by a refreshing swim! Regardless of a camper’s skill level, our staff focuses on skill development, participation, teamwork, and fun! This is a popular activity at SMA. We provide rackets and balls, while you supply the energy! 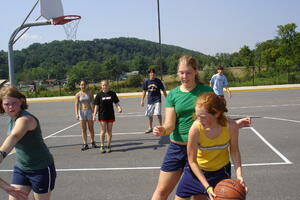 We don’t have courts here at camp, but we utilize the courts at Juniata College, only eight miles away. 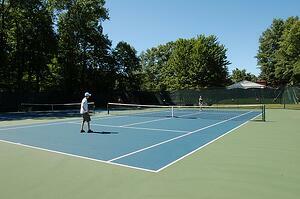 Please note that we don’t offer formal tennis lessons but offer recreational tennis for everyone! 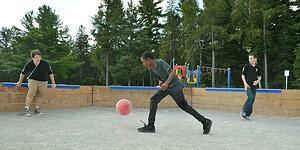 There’s nothing better than a great game of soccer at Stone Mountain Adventures. Also known as the “World’s Game,” it’s extremely popular here at camp, where staff and campers play together and make each game exciting for everyone. Our international campers and staff especially bring a level of energy and passion that make every soccer game awesome! Whether it’s a friendly game of knockout at camp or a full-on game on the courts at Juniata College, basketball is fun for everyone! Please note that we don’t offer formal instruction in basketball, but if you need help with your jump shot or layup, our friendly staff members are there to help! Did you know that more frisbees are sold in the US each year than baseballs, footballs, basketballs, and soccer balls combined??? Frisbee is probably the most popular athletic activity at Stone Mountain Adventures, and for good reason! There are few things better in life than chasing down a flying frisbee, and even the dogs at camp try to sneak in a game from time to time. Flag football at SMA is thrilling and safe. It’s also quite entertaining to teach to our international campers and staff! 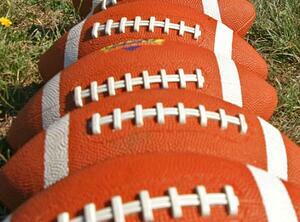 We bring the flags and the footballs and you bring the enthusiasm. We also mix up the rules from time to time, so you never know what to expect when you sign up for flag football at SMA! 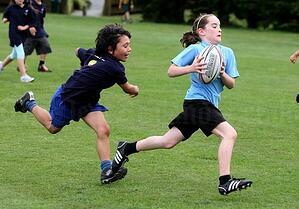 While not a traditional American sport, rugby is an exciting game that combines skill and dexterity. All passes must go backwards while teams run the ball to advance it down the field. Our enthusiastic international counselors love to teach rugby almost as much as they love to play it! Gaga is one of our newest games at SMA, but one that’s become super popular! This game is sort of like dodgeball, except we play it on a homemade court and there aren’t any teams! You’re allowed to slap the ball with your hands, but if the ball touches you below the knees, you’re out! Let the fun begin! Whether it’s a full game or a home-run derby, softball at SMA is always fun for everyone involved! 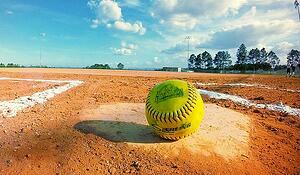 We provide gloves, bats, helmets, and balls. Often our American campers enjoy teaching their international peers how to play! At SMA we have our very own nine-hole Frisbee Golf Course! Also known as Disc Golf, this sport is played using special frisbees (which we provide) and baskets, which act like the holes in regular golf. Each player attempts to throw the frisbee into the basket in as few throws as possible. 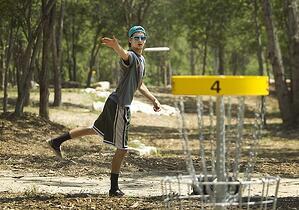 Frisbee golf is also a great way to explore the woods and develop throwing skills! We also travel to other courses in the area including courses in State College, Altoona, and Juniata College! 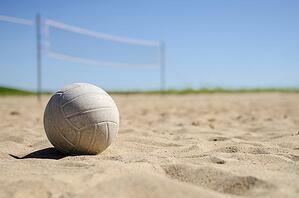 Offered several times a week, volleyball is a hugely popular activity at SMA. We play at the nearby Greenwood Furnace and Whipple Dam state parks, where volleyball tournaments rage on morning and afternoon before ending with a sprint to the lake! We offer yoga as a morning activity a few times each session or sometimes as requested. Yoga isn’t just a great way to increase strength and flexibility (complementing our other camp activities), it also has a very calming and focusing effect on the mind. Don’t knock it until you try it!